12/7/96 Taylor Johnson/AA-S; Texas’ QB James Brown scrambles away from Nebraska’s Jared Tomich as he looks downfield for an open receiver. Brown was sacked only once today as they defeated Nebraska 37-27. Modern day college football took its first steps in 1996. With conference realignment came a new college football landscape. The Big 12 officially became a powerful conference on a level of a Big Ten and Southeastern Conference. Smaller leagues formed a new “mid-major” level of college division, like Conference USA, which consisted of schools left over from the SWC, Great Midwest Conference and Metro Conference. But another big thing: the end of the tied college football game. Overtime rules that took place in the 1995 bowl season were adopted to Division I college football, forever changing Saturday newspaper agates. Texas was now in the Big 12, a conference they still call home today. The league was split into two division, the Northern Division of Nebraska, Colorado, Kansas State, Missouri, Kansas and Iowa State and the Southern Division of Texas, Texas A&M, Texas Tech, Baylor, Oklahoma and Oklahoma State. The winners of each division would play in a new Big 12 Championship Game at the end of the season. The first Associated Press preseason poll showed just how good the Big 12 was at football. The No. 1 team was Nebraska, Colorado was No. 5, Texas No. 8, Texas A&M No. 13, Kansas State was No. 21 and, surprisingly enough, No. 24 was Kansas, who was coached by Glenn Mason at the time. Three top 10 teams– half the conference overall ranked — and it didn’t even include one of the conference best football programs, Oklahoma. Texas opened the season with a conference game against Missouri. It was the first time Texas had played the Tigers since 1986. The Longhorns took a 21-0 lead at halftime and continued to build it, winning 40-10. Texas had Priest Holmes back, joining sophomore Ricky Williams and senior Shon Mitchell to form, on paper, one of the most talented backfields in the history of Texas. Holmes rushed for 324 yards and 13 touchdowns his senior year. The running back from San Antonio Marshall High School was never a mega superstar at Texas — at least not compared to Ricky Williams or Earl Campbell– and went undrafted in 1997. But Holmes is arguably the second greatest professional running back to ever hail from Texas, behind only Earl Campbell. He caught on with Baltimore Ravens and helped the team win a Super Bowl in 2000. He signed a contract with the Kansas City Chiefs in 2001. In Kansas City he was a 3-time Pro Bowler, 3-time All-Pro, 2002 NFL Offensive Player of the Year, led the NFL in rushing touchdowns in 2002 and 2003 and would eventually join the Kansas City Chiefs’ Hall of Fame. For a comparison, as great as Williams was, he made one Pro Bowl and was an All-Pro once. While Holmes racked up the touchdowns, Williams continued what would be one of the greatest college careers of all-time. He rushed for 1,272 yards and 12 touchdowns, averaging 106 yards rushing per game. Mitchell’s numbers dropped from 1995 as he went for 686 yards and scored four touchdowns. Despite the heavy rushing numbers, Mike Adams, now a senior, caught 56 passes for 942 yards and five touchdowns and quarterback James Brown threw for 2,468 yards with 17 touchdowns. Defensively, Texas had four players record more than 100 tackles: Chris Carter, Tyson King, Aaron Humphrey and Dusty Renfro. Bryant Westbrook picked off two passes and recorded 56 tackles he became Texas’ top defensive back. And all this talent was on display in the first Big 12 game. Williams scored four touchdowns. Westbrook blocked a punt and returned it 35 yards for a touchdown. Defensive lineman Cedric Woodard had a sack for a 13 yard loss. Even kicker Phil Dawson hit two field goals in the game. UT Longhorns v. Missouri. Season opener. Photo by Karren Warren … AA-S …. 08/31/96. But the 1996 season was actually a massive up and down season for Texas. Entering the third game of the year 2-0 and hosting No. 9 Notre Dame, Texas lost 27-24 as the Irish nailed a 39-yard field goal as regulation ended. The hangover continued as Texas lost 37-13 the following week at Virginia. Texas did get back on the right track the next week, scoring 71 points (the most points Texas has ever scored in a Big 12 game) against Oklahoma State. This set up the first ever Texas-Oklahoma Big 12 game. Which also is the first overtime game Texas ever played. Oklahoma hit a 44-yard field goal with 2:26 left to force a 24-24 tie and the game went into overtime. With college football overtime rules, Oklahoma won the toss and Texas started with the ball in overtime. After stalling on offense, Dawn hit a 43-yard field to give Texas the lead. But Oklahoma responded with a 2-yard touchdown run from James Allen that gave the Sooners the win. Texas dropped to 3-4 on the year the next week with a road loss to No. 8 Colorado. Mark Matson AA-S (11/29/96) A&M Runningback Eric Bernard is gang tackled by several Longhorns during First Half action of Friday’s game. The Longhorns then entered a stretch where they played familiar old SWC teams and won four straight games, including an absolute demolition of Texas A&M, 51-15 at home that clinched Texas the Big 12 South division title. Texas was now set to play No. 3 Nebraska– the defending national champions– in the first ever Big 12 Championship Game. Let’s roll this game out. A bouquet of tulips arrived at Bellmont Hall on Thursday, addressed to James Brown, courtesy of a group of female Nebraska fans who were grateful for the Texas quarterback’s offhand prediction that his team would beat the No. 3 Cornhuskers by three touchdowns. Texas didn’t win by three touchdowns. They did lead 20-17 at halftime, and went up 23-17 before freshman DeAngelo Evans’ touchdown run gave the Huskers the lead, 24-23. They tacked on another score early in the fourth quarter to make it 27-23. Then Brown connected with Wane McGarity on a 66-yard touchdown pass with 8:53 to go that gave the Longhorns a 30-27. 12/7/96 Ralph Barrera/AA-S; Texas’ Wane McGarity hauls in a pass and races Nebraska’s Eric Stokes to the sidelines for a big gain. McGarity later scored on a long pass play in the fourth quarteras th Horns won 37-27. Texas got the ball back with less than three minutes to play in the game. Pinned back in their own territory, Texas faced a fourth down and inches. Now, with the lead, many would think that punting the ball and letting your defense work would be the obvious choice. Not Texas coach John Mackovic. With three running backs lining up behind James Brown, the quarterback faked a handoff to Holmes, rolled left and hit Derek Lewis with, essentially, a game-clinching conversion. Lewis took the ball into the Nebraska redzone and set up an 11-yard Priest Holmes touchdown that was the cherry on top of an upset Sunday. 12/7/96 Taylor Johnson/AA-S; Texas RB Priest Holmes high steps his way into the endzone past Nebraska defender Ralph Brown during first quarter action. Holmes was the go-to guy scoring thre Texas TD’s in their 37-27 victory. After the game, Wangrin put Brown’s play in the same lore as James Street’s pass to Randy Peschel in the 1969 “Game of the Century” against Arkansas and Street’s pass to Cotton Speyrer later that season against Notre Dame. Here’s his complete breakdown of the play. The win put the Longhorns, now ranked No. 20, in the Fiesta Bowl, where they would play No. 7 Penn State. The Longhorns led 12-7 at halftime, but a 21-point third quarter by the Nittany Lions swung the game and Texas lost 38-15. 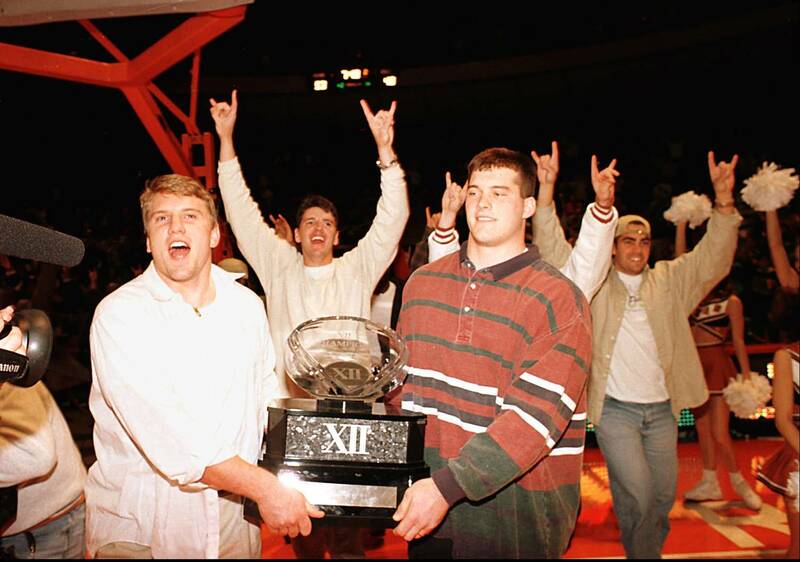 In the end, Texas went 8-5 in 1996. After the season, Westbrook became the fifth pick of the 1997 NFL Draft, heading to Detroit. He was a second team All-American in 1996 and a member of the first-ever all-Big 12 team. The “Roll Left” game would be John Mackovic’s greatest moment at Texas, but after that play things started going downhill.